"What is interesting about Warhol is not the retinal image of a man who paints 50 soup cans, but of the man who had the idea to paint 50 soup cans." Born Andy Warhola in a bleak Pittsburgh slum, Andy Warhol, called an American Iconographer, became a pop icon himself before his death in 1987. He hopped on the Pop Art stage in 1962 to join—and eventually surpass in notoriety—Roy Lichtenstein and Jasper Johns. Warhol began his career as a commercial artist and it's easy to make the connection between brand exposure and his repetitive silkscreened images. Beginning the process with photographic transfers, the "art" was in the imperfections of the process, the nuances that made these similar images dissimilar. Eventually, Warhol moved on from applied techniques to producing music (The Velvet Underground) and film (Sleep, Chelsea Girls, etc. ), then publishing (Interview magazine), until he came back to painting collaborating with Jean-Michel Basquiat. This documentary is a collage of stock footage (Pittsburgh, NYC), film clips and interviews (both archive and contemporary)—there seems to be no shortage of people willing to discuss the artist and his work - and who'll gladly talk about themselves. Overall, it is clearly a homage to the man and his work; there are no opposing voices, no one criticizes, analyzes or questions the phenomenon of his fame. 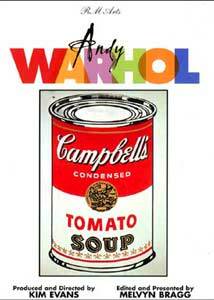 While not a fan of Andy Warhol, I am a lifelong student of the concepts that lead to art. Warhol was a man of many such concepts and a look at his work is a must for those interested in the names that changed the face of art in the 20th century. It is encouraging to find programs like this available to everyone on DVD: MORE, please! Image Transfer Review: This documentary pulls from many varying sources, many of them showing severe signs of age and abuse. The clips and archive interviews have dirt and speckling everywhere, but this is in the source; the transfer seems fairly direct. Color and black levels are all over the board; still, this is a watchable presentation. Audio Transfer Review: The audio is a mono track, as one can expect from a documentary of an artist's life; nothing more is necessary. Again, with the variety of sources drawn together here, the quality varies but is ultimately clean enough to understand at all times. Some of the older clips have quite a bit of hiss, but nothing that detracts overall. Extras Review: Static menu with 12 chapter-stops, which are also listed inside the Snapper case. There are many possibilities for value-added extras on discs of this kind; very few documentaries cover all of an artist's work. A stills gallery; an essay by an art critic or historian that might provide an interesting perspective to the program's view; a look at the artist at work are just a few. Having the lives and work of artists available on DVD is an important branch of this versatile medium. Andy Warhol is a well-conceived archive of the artist's rise to fame and documents his work, created in a wide range of media, in one accessible collection.